Karlsson’s Vodka is the story of a few families from a small part of Sweden who joined together to create a unique Vodka out of a rare and expensive delicacy. 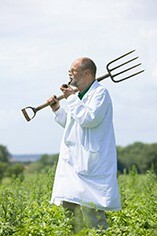 In 2001 the potato farmers of Bjarehalvon were in jeopardy of losing their family farms to golf clubs and resorts. The farmers recognised the superior quality of their crop but didn’t have a system in place to efficiently to be able to sell them. After developing a successful co-operative to sell their unique crop, “Farmer’s Gold”, they took their initiative a step further to start making Vodka. Borje Karlsson, the Master Blender from Absolut Vodka took up the challenge and after a few years of trials he finally came up with something to which he was willing to add his name. Karlsson’s Vodka is a single-distilled and unfiltered expression of the delicate raw ingredients from which it is made. This is the world’s only Vodka made from virgin new potatoes. Each varietal is distilled only once through a continuous, column still lined with copper. They are then blended without charcoal filtration which would otherwise remove valuable flavour elements. The resulting Vodka is full bodied and rich with a distinctive viscosity and mouthfeel. Distilled once and unfiltered to preserve the rich taste of the delicate, young potatoes, the vodka’s unique character is the result of the quality and quantity of the ingredients from which it is made. 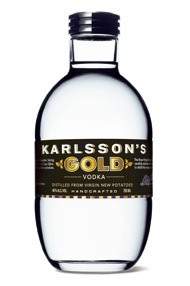 Approximately seventeen pounds of Virgin New Potatoes are needed to make just one bottle of Karlsson’s Vodka. Developed by Master Blender Börje Karlsson, Karlsson’s Vodka is a beautifully balanced and smooth spirit, possessing some unique qualities of character and natural taste. Karlsson’s Vodka honors the heritage of vodka by going back to an artisanal, handcrafted aesthetic that preserves as much of the inherent flavor as possible.